Jenkinson had made a map of Russia. Of that there was no possible doubt because there were three known derivative maps, all of which acknowledged Jenkinson’s map as their source. There had been a great deal of speculation about what the original map might have looked like, but no one had been able to find one, and it seemed as though they never would. However, all that changed not long ago, when Mme. 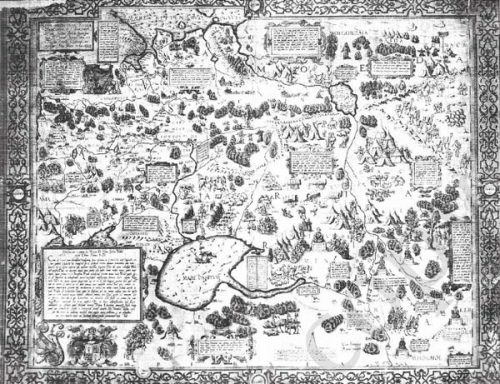 Krystyna Szykula, map curator of the Wroclaw University Library, claimed that she had found an original print of the Jenkinson map. She made her claim in 1989, at the 13th International Conference on the History of Cartography at Amsterdam. Her dramatic announcement created something of a sensation, but there is no doubt at all that she was right. She had indeed discovered a print of Jenkinson’s original map. The story goes that a schoolchild had found the map in a cellar after the end of World War II, and had given it as a present to her high school teacher in Wroclaw. Many years later, in 1987, the teacher took it to Mme. Szykula, who quickly recognised what an important find it was and arranged for it to be purchased by Wroclaw University Library Cartography Department. It is undoubtedly a print of Jenkinson’s original map, the one from which the three maps already mentioned were derived. The Jenkinson map is large, a wall map, measuring 101.5 cm across by 79.7 cm vertically, framed on all four sides by a six centimetre wide band of decoration that resembles ornamental wrought iron work. At the foot of the map is a scale in English miles, Russian versts and Spanish leagues. The degrees of latitude are marked on the sides, but longitudes are not shown. The map covers an area that extends from the Bay of Finland in the Baltic to Tashkent, and from the Arctic Sea, including the southernmost tip of Nova Zemblya, as far south as Persia. The map is delightfully illustrated with numerous miniature scenes: a camel caravan; numerous turbaned men in various postures such as on horseback or sitting beside tents and cooking over a fire; in the north there are reindeer, men on sleighs, some pulled by dogs and another pulled by a reindeer; and a man on skis firing a bow. Also in the north there is a small group of people apparently praying to a flag or other object on a pole; further south there are flocks of sheep and horses, and a group of camels each pulling a wagon with a round hut on it; and in the Crimea there are groups of mounted men firing arrows at each other. There is an illustration of a Kirghiz ritual in which, according to the text panel next to it, a priest, high in a tree, squeezes the juice from a mixture of blood, milk, ox dung and earth onto the supplicants below. “This sprinkling is worshipped as a god”. The human figures shown hanging from trees are because, “When someone among them dies on a day they suspend him from trees in the place of burial”. There is a sketch of Ivan IV sitting on his throne and another one of the Zlata Baba, the ‘Golden Woman’. The Zlata Baba was a powerful religious image of the Samoyedes of Western Siberia, now called the Nenets. They had a totemistic religion associated with shamans, and with animal sacrifices at sacred sites. Jenkinson, in his map, called the area Ugria and showed a group of Ugrians kneeling before a female idol. 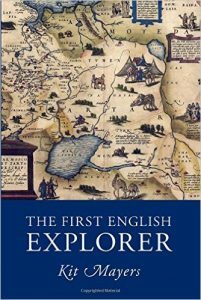 There are altogether about 27 boxed sections of descriptive text in Jenkinson’s map.